• Born in Welkom on 24 September 1956. • Ordained a priest on 19 November 1983. • Ordained Bishop of Kroonstad on 28 January 2007. 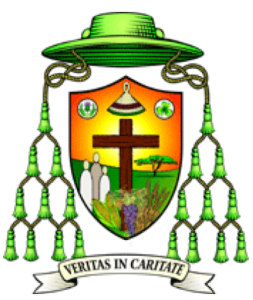 The Coat-of-Arms of Archbishop Brislin expresses his motto Veritas in Caritate – truth in love, taken from Ephesians 4:15. The centre is the empty cross of the resurrected Christ, from which all life comes. The rising sun is the promise of eternal life. The brown represents the dryness of certain parts of the Free State where the Archbishop has his roots, and also represents life without Christ, since fruitfulness and life come through the cross. This life is depicted by the people, the Acacia tree, the maize, the wheat and the grapes – also representing the Western Cape and reminding us of the Body and Blood of Christ. The Basotho hat reflects the majority of the people to whom the Archbishop ministered and also the “crown” of Kroonstad. The thistle represents the maternal roots of the Archbishop, namely Scotland. The shamrock represents the paternal roots of the Archbishop, namely Ireland. he civil districts within the ecclesiastical area of the archdiocese are the districts of Cape, Wynberg, Simon’s Town, Bellville, Somerset West, Stellenbosch, Paarl, Wellington, Caledon, Bredasdorp, Malmesbury, Piketberg and Clanwilliam. From the time of the discovery of the Cape, ecclesiastical jurisdiction over it appertained to the Portuguese missionary authorities. After the settlement of the Cape in 1652, the practice of the Catholic religion was prohibited by the civil authorities. Commissioner General De Mist, by ordinance of 25 July 1804, declared that “all religious societies which for the furtherance of virtue and good morals worship an Almighty Being, are to enjoy in this Colony equal protection from the laws…” and in 1805 three Dutch priests arrived to minister to the Catholics of the Cape. 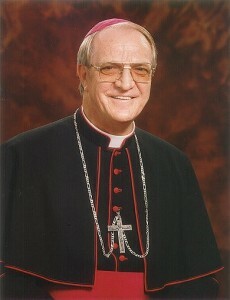 One of them, Father Johannes Lansink, was appointed Prefect Apostolic (a title more or less equivalent to that of bishop, but used in missionary areas). The following year the military authorities ordered them to leave. In February 1818 Pope Pius Vll erected the Vicariate Apostolic (a title more or less equivalent to that of diocese, but used in missionary areas) of the Cape of Good Hope and adjacent areas. Subsequently the “surrounding islands” were added – and these included Madagascar, Mauritius, Australia and New Zealand. The first Vicar Apostolic, the Right Reverend Bishop Bede Slater, OSB, having called at the Cape, went to reside in Mauritius. He was succeeded by the Rt Reverend Bishop William Morris, OSB, who also resided at Mauritius. 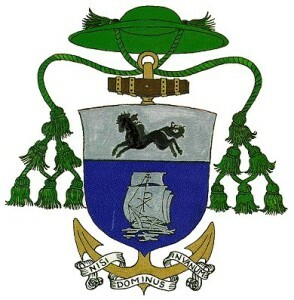 On June 6, 1837, Pope Gregory XVI constituted the Cape of Good Hope a separate vicariate (again similar to a diocese) and appointed the Rt Reverend Bishop Patrick Griffith, OP, as the first resident vicar apostolic (a more advanced title than prefect apostolic, and still similar to bishop). In 1847, the Vicariate of the Cape of Good Hope was divided into the Vicariates of the Western District and the Eastern District of the Cape of Good Hope. On May 24 1872 the Prefecture of the Central District of the Cape of Good Hope was detached from the Western Vicariate. By decree of the Sacred Congregation of Propaganda Fide (that department in the Vatican which deals with missionary territories) dated June 13, 1939, the name of the Western Vicariate was changed to the Vicariate of Cape Town. On January 11, 1951, Pope Pius Xll established the ecclesiastical hierarchy in the then Union of South Africa, and set up the ecclesiastical Province of Cape Town, comprising the metropolitan church of Cape Town, with the suffragan sees of Aliwal, Oudtshoorn, Port Elizabeth, Queenstown and De Aar. By the same bull, the Most Reverend Archbishop Owen McCann was appointed to the Metropolitan See of Cape Town. The islands of Tristan da Cunha, Gough, Ascension and St Helena belonged to the Archdiocese of Cape Town until 18 August 1986 when they were given to the care of the Mill Hill Fathers, whose residence is based on the Falkland Islands. The Catholic Church throughout the world is divided into administrative units called dioceses. Each diocese is headed by a bishop. 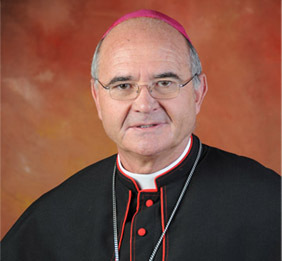 In some cases (as in South Africa) those dioceses which are of greater political importance are called archdioceses and are headed by an archbishop. In South Africa there are four such archdioceses, one of which is Cape Town. Because Cape Town is the seat of parliament and the legislative capital of South Africa, it is ecclesiastically known as a metropolitan diocese – with the dioceses of Aliwal, De Aar, Oudtshoorn, Port Elizabeth and Queenstown as its suffragan sees. These other dioceses rely to some extent on Cape Town for ecclesiastical support, although they are in no way subordinate to Cape Town. To help him administer the Archdiocese of Cape Town, the Archbishop has appointed two vicars general. Both carry the title of Monsignor. A chancellor is appointed in each diocese, whose task it is to act as a notary or someone who authenticates any official document which the archbishop might issue. To help in the ministry of the various departments of the Archdiocese of Cape Town, a number of priests have been appointed as vicars or heads of those departments. Together with an equal number of other priests elected by the priests serving in Cape Town, these constitute the presbyteral council, and it is from this body that the archbishop chooses his consultors or advisors. In order to co-ordinate the pastoral function of the various parishes in Cape Town, five deans have been elected by the priests as their spokesmen in certain matters. The body of deacons constitutes the Council of Deacons and the Archbishop appoints a co-ordinator as a liaison between himself and the deacons. The geographical area of Cape Town is divided up into 80 autonomous areas called parishes. 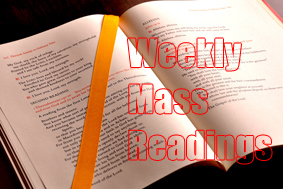 Each parish is obliged to have its own pastoral council as well as a finance council. Representatives from these parish councils – as well as of other bodies – together form the Archdiocesan Pastoral Council whose task it is to advise the archbishop in certain matters. In total the archdiocese covers an area of 30 892 square kilometres with a total population of 4 320 000 people, of whom 251 300 are Catholics (as of 2016). News Archive. Postings on the web site for the period September 2000 to the present.